This survey is for any child ages 6 to 18 years old who lives in Canada. Cette enquête s’adresse à tout enfant âgé de 6 à 18 ans vivant au Canada. 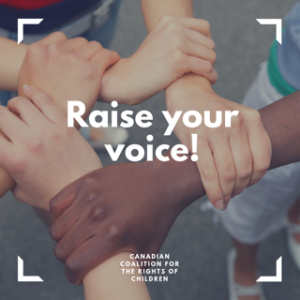 We want to learn what you know about children’s rights and how you participate in decisions that affect you in Canada. Your answers are important! 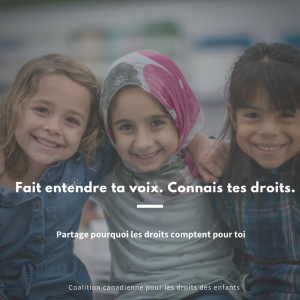 They will help us to learn about children’s rights in Canada and to write a report for the Committee on the Rights of the Child (a group of global children’s rights experts in Geneva) who will review how Canada is doing to make sure that children have access to their rights. 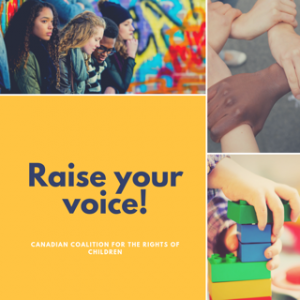 The survey is available on the Canadian Coalition for the Rights of the Child (CCRC) website and will be shared with children all across Canada. Please fill out our online survey. Share it with your friends, classmates, and other young people you know to complete. It should take between 5 and 20 minutes to complete. Will everyone know it was me that wrote an answer? No! All your answers are confidential and you will remain anonymous. This means that no one will know what your responses are except you. What if I want people to know what my answers are? What if I want to share more than the answers of the questions? Feel free to email us and share further reflections you have! If you, your school, community group, or another group want to write a report/develop a creative video, art piece, poem or other expression, please do! And share it with others.